Clinicians can use the iGetBetter platform to get patients ready for their surgical day by requesting patients perform certain PT exercises, monitor pre-op joint pain levels, deploy teaching points about their pending surgery, how to prep the surgical site, and how to adjust their medications in the days leading up to their surgery. Patients are asked daily pointed questions about important parameters such as various levels of pain (while moving, at rest, and with flexion), nausea level, as well as nightly quality of sleep. Patients who neglect to log completion of these activities can then receive an afternoon automated phone call reminding them to do just that if the clinician deems this to be helpful. The core of the Total Knee Replacement Care Plan can feature a rotating and evolving series of short, daily, physical therapy videos which can come from the patient’s own clinical staff/institution depicting exactly what exercises should be performed and how to correctly perform them—and these PT videos can be presented to the patient on the exact post-op day that is optimal for the rehabilitation process. Meet CMS requirements for Patient Reported Outcomes (PROs) with iGetBetter. Voluntary submission of THA/TKA patient-reported outcome measures is the easiest thing that hospitals can do to get started on the road to gain sharing. Submission of PROs offers a 2 point bonus on quality scores and is the first step towards measuring and improving outcomes. Careful study of PRO data will provide insights into what’s working and what isn’t and offers a competitive advantage for hospitals. Hospitals need to report 50% of their patients’ PRO data or at least 50 patients to earn two additional bonus points on their composite quality score. Patitent Reported Outcomes measures that CMS is accepting include VR-12 or PROMIS-Global, Knee injury and Osteoarthritis Outcome Score (KOOS) or Hip injury and Osteoarthritis Outcome Score (HOOS). This basic care plan is totally customizable down to the level of the individual patient. Specific "normal" parameters can be set for individual patients as far as their subjective pain levels are concerned. 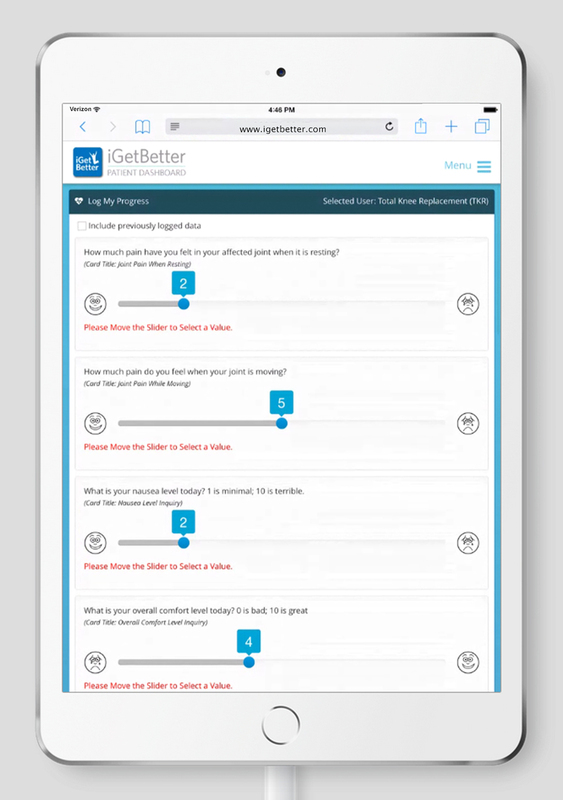 Clinicians are always encouraged to work with iGetBetter to add their own elements to to thereby deploy a Total Knee Replacement Care Plan that is “their own.” Individual messages to patients can even be created and delivered to patients exactly on the date that clinicians want them to appear. The iGetBetter TKR care plan thus seeks to maximize both patient engagement and the clinician's daily schedule with the goals of improving the overall health of the patient population while lowering costs to the provider network.